maggie sottero wedding dress size 10. Condition is Pre-owned. Shipped with USPS Priority Mail. Maggie Sottero Wedding Dresses, Stunning! This dramatic and artful presentation of the illusion lace corset stops just short of the natural waist transitioning to elegant Demir Stretch Satin in a fit and flare silhouette, detailed with a glamorous satin sash, bubble hem, Swarovski crystals and corset back closure. Gown is also available with a lined bodice as style J1513A. Retail: $1,836.54 USD Size: 10 Color: Ivory ****Instead of a Satin Sash by the waste. I added a Diamond Kitty Belt instead*** See picture #5. Colour - White or Ivory. Material- tulle, lace. This beautiful wedding dress will be. • Dress colour. one handmade wedding dress. UK Size Chat. Champagne Lace Tulle Vintage Wedding Dress. Bust 90-92cm, waist 74cm , hips 97cm , hollow 134cm , height 162. Brand new. Never been worn. Just tried for pictures. On Milly Bridal website £196.99 My price is £95 Thank you for looking. Features an embroidered bardot inspired neckline with 3/4 length sleeves, an embroidered fittied bodice, and a maxi skirt with a fishtail embroidered hem. This bridal gown oozes ellegance and sophistication. Beautiful ivory/light gold wedding dress size 18. Street size 14. Never worn, decided to go with a different style. Sweetheart brand from 2016. Condition is New with tags. Non smoking home. Great, affordable option for Spring/summer wedding! Shipped with USPS Priority Mail. Princess style wedding dress in ivory tulle with champagne embellished lace and beadwork. Designer Carl Monk, for Margaret lee. Coffee coloured contrast satin waistband with fabric flower. Chapel length train. Satin fabric, white colour. round neckline. Fabric label- none. Label - none. Dress is a size 12. A faint mark on the front skirt and the underneath train has lots of marks - see pics, otherwise. a gorgeous dress with fab train and feature crystal decoration and just look at the crystal buttons down the back. You can be rest assured that your gown will be beautifully finished. Colour - picture colour. Fabric - Lace. This beautiful wedding dress will be. • Dress colour. UK Size Chat. • Dress size. one handmade wedding dress. White lace with ivory lining. Fabric label- polyester. V shape peplum from waist. small faux pearl buttons on bodice. bfitted bodice, boned. plastic zip at back. Label - Karen Okada. It has an illusion neckline, half-length sleeves, and a keyhole back detail, This elegant piece also boasts a stunning 35cm puddle train that moves beautifully as you walk. Features a hook-and-eye fastening on the neck, and a concealed side zip. Beautiful "Pearl" as described from the Phase Eight website Katherine wedding/bridal dress in a fishtail style hemline with all over chiffon ruffles and cute little grosgrain ribbon and bow at the waistline. Ivory satin lining with white lace overlay on bodice & sleeves. Armpit - armpit - 19". long sleeves. Sleeve length - 24". Bust - 38". high waist. Fabric label- none. Inner 'Catherine Deane' label removed. 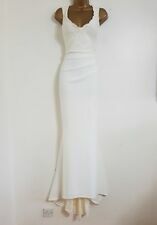 Neues AngebotSize 14 dark ivory wedding dress Anu Pam new. Fabric - Tulle. Colour - White or Ivory or other Colours. You can be rest assured that your gown will be beautifully finished. If you are unsure of the style of dress that will suit you - This is the one. White chiffon with beige lace appliques. sheer, see through, not lined. long train with flounce & lace appliques. Length from waist to tip of train - 90". plastic zip at back. Bust - 34". Fabric label- none. Brand New wedding dress. Adjustable back, size is around UK 8-12. This beautiful dress is now offered for sale as we are making space for new stock. This dress has been a sample in our little Bridal Boutique, it has been well cared for. This gorgeous dress has a subtle sparkle on the lace with a stunning beaded belt. The designer states that this is a size 10 and will fit the following body measurements: Bust 36” Waist 28” Hips 40” We always recommend engaging the services of a professional seamstress to make sure the dress fits you perfectly and it can easily taken in by a few sizes. Please contact me if you would like to try the dress on or have any questions or require any further information. However, did not wear it as I recycled my mother's wedding gown eventually. Get in touch for more information. With a stunning plunging V neckline with a beautiful beaded trim. From the Venus Informal Collection, made from lush satin material, the deep low back features a zipper back with elegant buttons. Used once, beautiful wedding dress. Needs a wash, hence low price, see pictures. Grab yourself a bargin! Any questions please do not hesitate to contact me. Ivory wedding gown by Dessy of New York. Satin with lace overlay. Scooped open back detail. Boned bust and bodice. Small train at the back. Worn once. Originally listed at £95.00. Price reduced to £75.00. Becauseo f co rs et b ac k it c an r an ge f ro m. 12t o a 16 i n si ze. 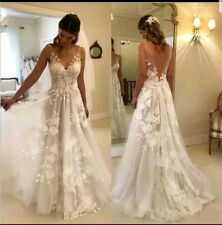 B on ed b od ic e de si gn er i s BenjaminRoberts al so c om es w it h ca rr y ba g. St un ni ng d re ss w it h a tr ai n ,Chrystal embroidery,c ol ou r li gh t ch am pa gn e.
Neues AngebotBeautiful Size 10 ivory wedding dress. Cece forever. Grab a bargain! An absolutely beautiful piece worn for a few hours on an engagement. Peach coloured Maxi dress with intricate diamanté and pearl work border topped with fully embroidered jacket Comes with scarf with diamanté spray and border Also included is a unique handmade grey velvet shawl which I designed especially for this dress. Bought from Birmingham’s 7aatrang. Current season RRP £595 Don’t miss out. Ivory ruched Wedding Dress. Condition is Used. Dispatched with Royal Mail 1st Class.